If you're a special educator or transition coordinator for high school students with disabilities, you play a critical role in empowering young people to achieve their goals and dreams. It's a complex and challenging job.and this introductory guide will help you every step of the way as you support students' successful transition to college, work, and community life. You'll get the how-to guidance you need to master all the basics of transition planning and services, from assessing each learner's strengths and writing IEPs to evaluating student progress. Research-based strategies help you develop effective plans with confidence, and the reproducible checklists and forms keep critical information organized as you prepare each student for life beyond the classroom. 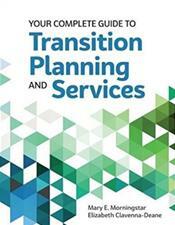 A must-read for all transition coordinators--and any secondary educator with a role on the transition team--this book is your essential guide to supporting successful, self-determined futures for all your students.